Baked or fried these are a fun way to use up any left-over mash potatoes… or, a good excuse to make more! Preheat the oven to 425°F degrees, unless pan frying. Cook the bacon until crisp. Drain on a paper towel and set aside. In a medium sized mixing bowl, combine the leftover mashed potatoes with the eggs, cheese, chives and bacon bits. Mix to combine, cover and set aside in the refrigerator. Prepare 3 breading stations. One bowl of flour, one bowl of beaten eggs and one bowl of panko bread crumbs mixed with the Parmesan cheese. Dust your hands with flour and use an 1/2 ounce portion control scoop to measure the balls. Or a Tablespoon. Pat them gently to form them into balls and roll them in the palm of your hands to get them perfectly round. Immediately dust them with flour again and set aside. Repeat until you have 24 flour-dusted balls. Drop a ball into the egg mixture and use a spoon to turn the potato ball over until fully coated. Lift the potato ball out of the egg mixture with a fork. Drain off any excess. Immediately drop the potato ball into the panko and cheese mixture and use another spoon to dredge it fully. Pat in any excess bread crumbs that might be falling off the ball. Set aside on a parchment lined cookie sheet and repeat with remaining balls. Fry in batches in hot oil over medium high heat until golden brown on all sides, about 3 minutes. Drain on paper towels. Or, bake at 400’F degrees for 5-10 minutes or until golden brown. Serve with my homemade ketchup! Yum! 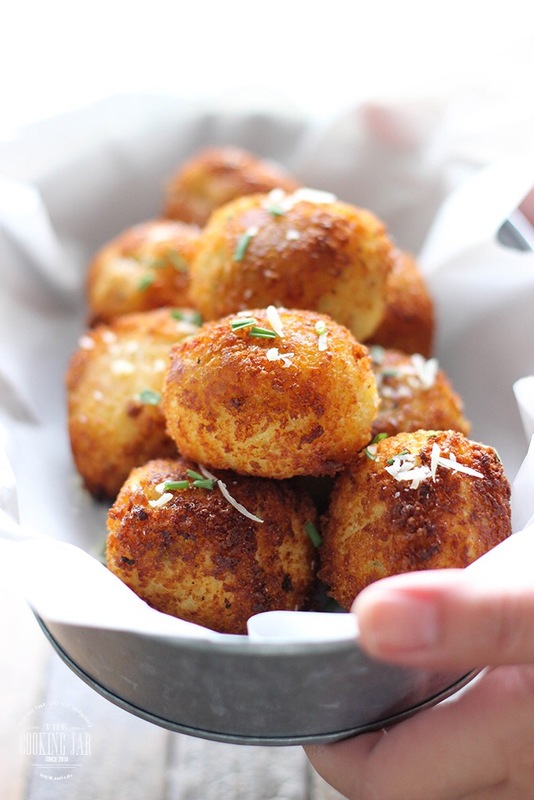 Makes approximately 2 dozen potato bombs! Turkey Pho Gà! A play on a classic. Vietnamese Chicken Noodle Soup.